I live in downtown Kingston, Ontario. Two doors away from me are two sweet old white ladies. They live in John A. Macdonald’s boyhood home where, according to one of the two plaques outside, he spent his “character forming” years. When I first moved to this street I noticed that during relevant occasions (Macdonald’s birthday and Canada Day), the current inhabitants put John A. dolls in their window, artfully lit so that they were visible from the street. 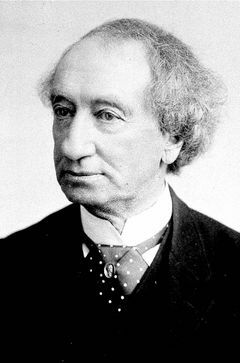 Next year this country, and especially my town, is preparing to celebrate the bicentennial of John A. Macdonald’s birth. Because I teach at Queen’s University and have an affiliation with the history department, I have been receiving fundraising requests from people in my town who are working hard to prepare celebrations for this event. Their funding request letters assure me that every living Canadian prime minister also encourages me to join in the festivities to honour Macdonald’s legacy. I suppose this is meant to convey that there is a range of political opinion here. But even if everyone from former Liberal Prime Ministers to former Conservative Prime Ministers think of Macdonald as a stand-up guy, that leaves quite a few of us who don’t. Others might be more inclined to remember Macdonald as the Prime Minister who oversaw the defeat of the Métis at Red River: “those wild people,” as he termed them. Or, as historian Tim Stanley has highlighted, the politician who shocked even his Parliamentary colleagues by arguing for Asian exclusion on the grounds that Canada was “Aryan,” and thus Chinese immigrants were a separate species. The only critical things one hears about Macdonald in public discourse in this town are jocular references to his drinking. Boys will be boys, Scots will be Scots. Things like this wear away at the soul, but, as we do for all things that hurt the soul, we develop coping mechanisms. I live in a conservative, Anglo town that blithely venerates someone who I consider to be one of the more despicable characters from Canada’s imperial past. But that’s not all that’s going on here, of course. When it comes to surviving here in Macdonaldlandia, many of us simply try to look the other way; and there is often enough to involve oneself in beyond the worship of this strange and awful man. Cleaning graffiti from statue of John A. Canadian Press. But as the birthday celebrations approach, clearly I have to start looking more directly at the things I walk past. 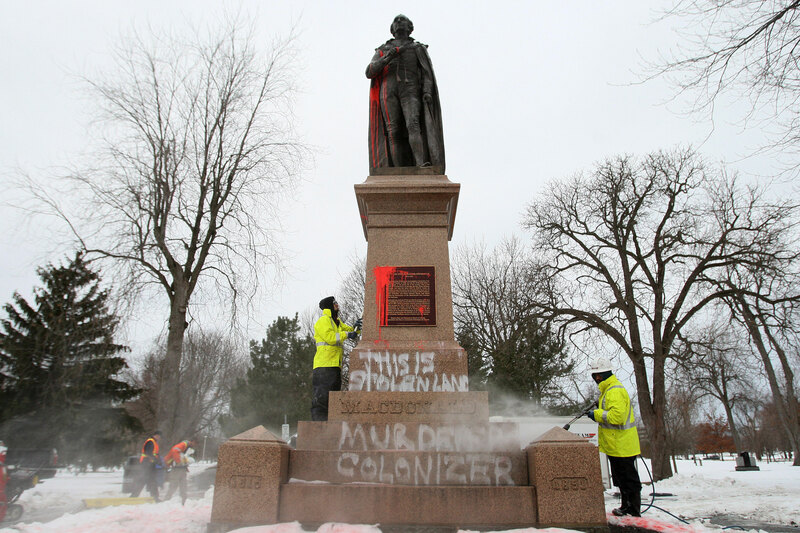 Last year, someone spray-painted “This is Stolen Land, Murderer, Assassin” on a prominent statue of Macdonald in a city park. Work crews quickly removed the graffiti and the town, as far as I could see, tried desperately to pretend it hadn’t happened. But something shifted. Last weekend I had the opportunity to hear two of my Queen’s colleagues, Laura Murray and Paul Carl, give a terrific presentation about Macdonald veneration in Kingston. They were kinder (and perhaps more strategic) than the graffiti artists. 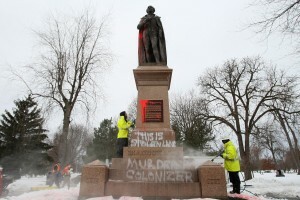 Their approach was to suggest we might turn down the volume on Macdonald-worship, and look instead to commemorating other aspects of Kingston’s past: its aboriginal history, for example. Molly Brant lived here too. 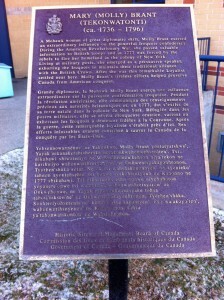 In fact, she is commemorated in a small statue and a plaque that, ironically, is also on my (and Macdonald’s) street. But this is no match for the dozens of plaques, statues, schools and streets that commemorate Macdonald. Not to mention the museum and gravesite. Murray and Carl gave their presentation at a two-day symposium titled “Critical Indigenous Reflections on Sir John A. Macdonald,” organized by the Queen’s Four Directions Aboriginal Student Centre. 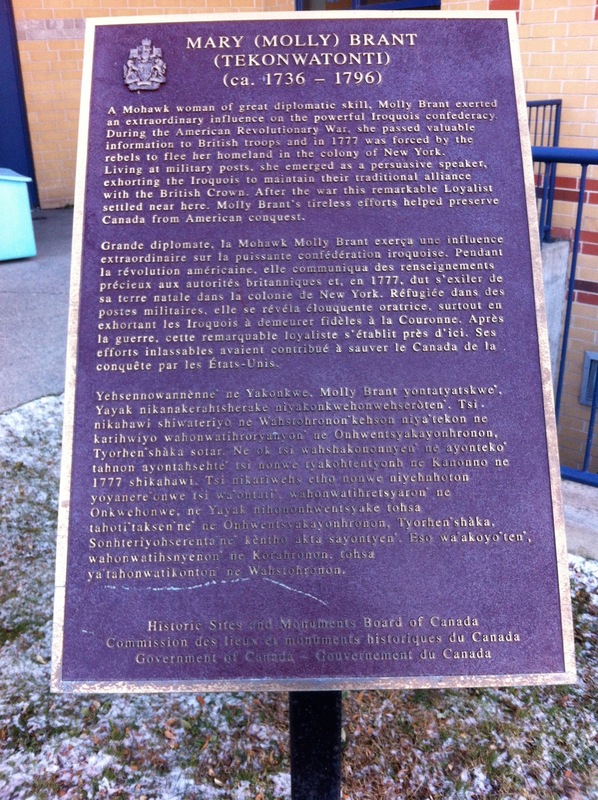 It included a presentation by a Queen’s grad student, Erin Sutherland, about her curatorial project “Talkin’ Back to Johnny Mac:’ Crashing Macdonald’s Birthday Party.” Sutherland plans to invite a number of indigenous artists to town to intervene artistically in the Macdonald veneration planned for next year. One of them, who also spoke at the conference, David Garneau, does things like making little nooses that he places in the packages of those Macdonald dolls my neighbours like to display. This is inspiring stuff, and I was about to start breathing a little easier in this town, feeling perhaps as though the nineteenth-century fog was lifting. Or, at least other voices were making themselves known, which indeed they are. 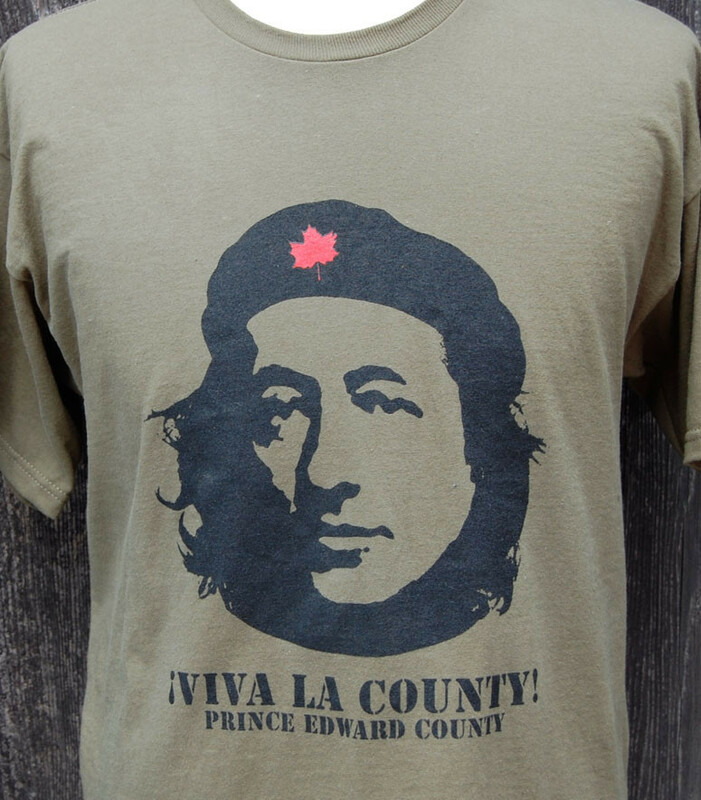 This morning Facebook (in the form of my indefatigable colleague Professor Murray) told me that there was a tee-shirt company in nearby Prince Edward Country promoting a design that mixes John Macdonald’s face with Che Guevera’s. 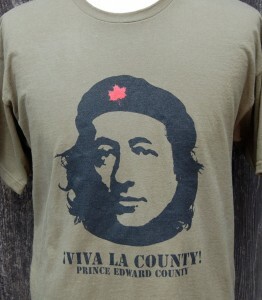 The shirt is promoted as “the definitive Canadian ‘Revolutionary’ T-shirt starring our first Prime Minister John A. Macdonald. The Revolution is just a t-shirt away!” Historically inaccurate, upside down and just plain dumb (for both Canadian and Latin American history) this too is an indication that Macdonald’s Bicentennial is shaping up to be a huge contest of competing images, stories and histories. So we have our work cut out for us here in Kingston. But for the first time in some years it seems like those who don’t want to join the parade will have somewhere else to look. Karen Dubinsky teaches in the departments of Global Development Studies and History at Queen’s University.